There was a moment, during my fourth year in New York, when I arrived home from a few days away to find that a pair of pigeons had moved into my kitchen. “Are those mine?” I wondered, looking up at them, before realizing that, no, they were not mine, because they were pigeons. This was not the moment I first felt like a New Yorker. The moment I first felt like a New Yorker came after I had wrestled the pigeons out of my apartment (Do you know how big pigeons are? They are very big), when I went to the bodega across the street to buy 1) several rolls of paper towels, 2) a gallon of bleach, and 3) a single beer. It was 1 in the morning. I expected a reaction. The bodega guy didn’t bat an eye. 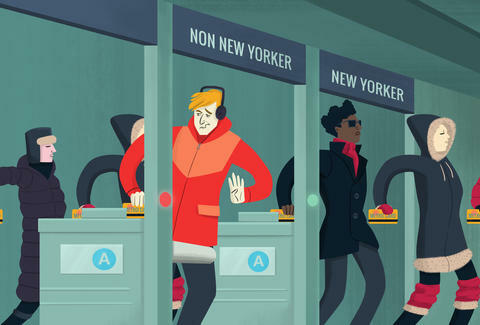 According to common lore, transplants officially become New Yorkers when they’ve been here 10 years. That is possible. I would not know (I am two years short). But the first flicker of belonging -- that can come at any time. We talked to New York transplants from big towns, small towns, and everywhere in between about the moment they knew they’d officially gone native. “It wasn't really until Hurricane Sandy that I realized that not only did I love New York, but that I was a New Yorker. The day after the storm, I was sitting in front of my laptop, scrolling through social media, looking at videos and photos of the capital-D destruction of the city. I saw a post looking for volunteers at the local YMCA, a nine-minute walk away, and it hit me: this wasn't destruction on the news. This was the destruction of my city, my home, my neighbors. I put on my coat, stuck a can of chili in my pocket (kind of dumb), and rushed to the Y. “There was this craft beer bar below my apartment. It wasn’t that loud when the bar was open, but then people would leave, and the staff would turn up the music from 12 to 2 in the morning. It would be this crazy death metal or club music -- definitely something vibration-focused. My entire bed would vibrate, and I’d have to call. Like, you had to say something. And they’d always pick up. Every night, they would let it ring for 5 or 6 rings -- you could hear it ring from my room -- they would pick up, and I would say ‘hi’ in this sweet voice, and they would act like they didn’t know who I was. It was this weird dance that we would do: I would ask them to turn it down, and they’d be like, ‘Oh my god! Of course!’ Every night for five years. “I landed at LGA last December, returning from a trip home to the Texas Hill Country. As I’m getting in line for a yellow cab, one of the cab drivers asks me where I am going. I tell him Bushwick. He starts asking down the line, and the couple behind me says they are also going to Bushwick. As it turns out, their daughter lives two blocks from me. At a rate of $50, we will share his car and share the cost. Fine. We are yelling at each other like people who have been in a much longer relationship. I have never yelled at a stranger this aggressively. There is a lot of pointing and scowling, and spitting, I imagine. I am pulling my bag across the median. I am now in front of traffic. “I’d been here maybe 5 weeks, staying on the floor of some friends who lived right off the 125th Street 1 stop in Morningside Heights. I was coming back from the interview at this hotel where I’d gotten a job as a bellhop -- which was good, because I was down to my last $200 -- listening to my iPod, feeling like I’d had my first New York triumph. "I got off the train, and noticed this guy on the landing. And I remember thinking, it’s weird that guy’s just standing on the landing, let’s give this guy a wide berth. But as I walked past him, I had this feeling I’d bumped into somebody. I turned around, and it was the guy, standing right behind me, holding this pair of glasses, and I see one of the lenses is broken. He says, ‘Hey man, you broke my glasses.’ And I was like, ‘I’m sorry?’ And he’s like, ‘You broke my glasses. I just got these glasses fixed, so you owe me a new lens. Give me $150.’ And I said I really didn’t think I did, and also I didn’t have $150. But he kept advancing on me. At this point, we were on the street, right outside this bodega, so he tells me to go in and get $150 and bring it to him. And I was like... okay? But you can’t actually take out $150 from an ATM, so I took out $160, which meant that I now had $40 left in the world. I handed it to him, and he said, ‘Hey, thanks man!’ And then he gave me this big hug and walked away.